The final conference of the project INTEMIS took place in Salerno, Italy. The project aimed to introduce ICT based flipped learning in VET schools and centers. It is an innovative and student-centered pedagogical approach, to increase the quality of teaching and learning, to help reduce early school leaving, to decrease the number of under-skilled teenagers, and ultimately to support modernization of education and training systems. 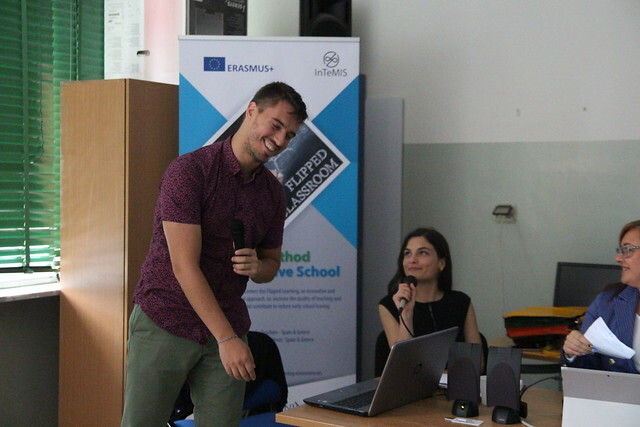 Partners from Italy, Iceland, Greece, Spain & Portugal presented to an audience of Italian teachers the results of the project and also introduced the flipped learning methodology. I.I.S Leonardo da Vinci school and Essenia UETP showed the results of the training in Spain and Greece and mentioned the advantages of choosing this educational method. Keilir school and Trollaskagi Comprehensive College from Iceland gave their expertise and their experience after their implementation of the method the last years in their faculties. Universidade Portucalense from Portugal and Inercia Digital from Spain gave various reasons on why flipped learning is beneficial and on the rise. And finally Action Synergy’s presentation gave a practical example on how a course can be created in flipped learning terms instead of traditional learning terms and spoke about the skills that are being developed through this method. During the conference the e-learning course of the project was also introduced. The access to the e-learning course which includes a presentation of flipped learning, guidelines & tools, methods & materials, information on the project and many extra resources will be free for the final months of the project and anyone can have free access to it by using the username “intemis” and the password “flipped”. For more information on the project you can visit the website. In order to have access to the e-learning course of INTEMIS click here.